Ingrid Bergman In Her Own Words makes clear that her life was messy and episodic, but she earned great love from her directors, co-stars, and family. Don’t wait for Mommie Dearest-style muckraking. Bergman would not be dictated to by the expectations of others, be they husbands, studio executives, or the public. For all her drive and preternatural beauty, she never wanted to be some goddess from another world. 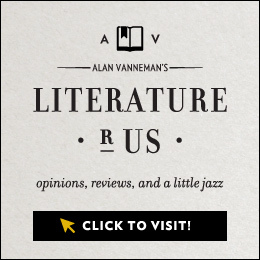 Her chosen life’s work was inherently artificial, but she strove to be forever real. 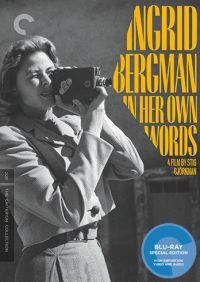 Ingrid Bergman In Her Own Words, a 2015 documentary recently released on Blu-ray by Criterion, is true to its title. 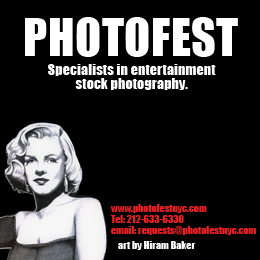 This is an unhesitatingly personal account of a major film star. We hear Bergman’s childhood diary entries read by fellow Swedish actress Alicia Vikander. Her own silky voice is heard in numerous film clips and interviews. Even her silence speaks to us in this rapturous but honest collage of her life and work. 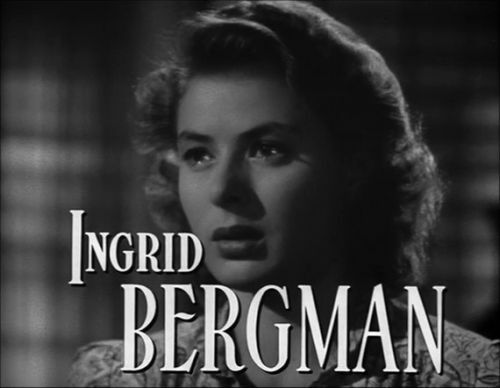 Before the opening credits are concluded, Ingrid Bergman In Her Own Words informs us of her mother and father’s deaths when she was a child, and her adoptive aunt’s death soon after. Though she received the loving attention of extended family in her early years, Bergman was largely denied a parent-child relationship, something that would later inform her art and her response to motherhood. This portrait paints Bergman as ambitious, restless, and determined. Though her father wanted her to be an opera singer, she never doubted her plans to be an actress. She enrolled in Sweden’s Royal Dramatic Theatre School, but soon began appearing in films. She favored film over the stage, entrancing audiences with her radiant youth and naturalism. No less than David O. Selznick was smitten as well, and starred her in Intermezzo: A Love Story in 1939 when she was 23. Bergman in the 1940s is distinguished by a blessed refusal to be sheathed and lacquered in conventional Hollywood glamour. The camera loved her so passionately that it hardly mattered. Light shimmered off her translucent skin and luxuriant brown hair, and cast a distinctive shadow over her full upper lip. Thanks to her breathtaking emotional clarity, close-ups amounted to making love to the camera. In Her Own Words is not primarily concerned with Bergman’s career. Instead, it concentrates on her life as lover, wife, and mother. Film writer and critic Stig Björkman directed with the cooperation of Bergman’s four children, who are candid in their on-screen reflections. We see slices of the many home movies she took through the years. They have an elegiac glow, and the vision of Bergman playing mother adds to the poignancy endemic to the genre. Though she delighted in making home movies, she never aspired to direct. Acting was her sole distraction, and she became the great muse to many directors of consequence, including Victor Fleming, Ingmar Bergman (no relation), Alfred Hitchcock, Sidney Lumet, Jean Renoir, Stanley Donen, Michael Curtiz, Leo McCarey, and George Cukor. Her life oscillated between public and private, and so does this film. Her early performance as a prostitute in Dr. Jekyll and Mr. Hyde (1941) is a fantastic example of a hungry young actress taking chances while daring her audience to look somewhere else. 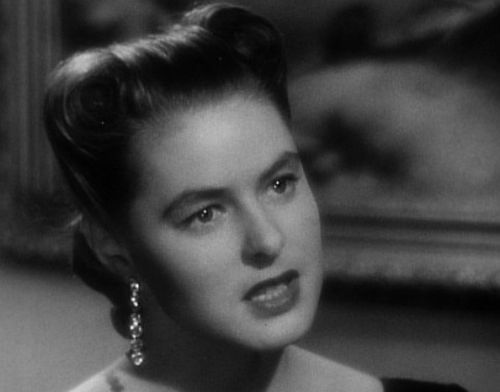 The following year she appeared in Casablanca (1942), and, well, here’s looking at you, kid. Casablanca rendered her a screen immortal, but it was no fluke as she delivered one stunner after another through most of the 1940s: For Whom the Bell Tolls (1943), Gaslight (1944), Spellbound (1945), The Bells of St. Mary’s (1945), Notorious (1946), and Joan of Arc (1948). By now she was married to dentist Petter Lindström and mother to daughter Pia, but we learn she had an affair with the great photojournalist Robert Capa during the war. There are curious omissions probably accountable to copyright restrictions. There are no clips from her Oscar-winning turns in Gaslight, Anastasia (1956), and Murder on the Orient Express (1974), the latter won more for Bergman adoration than her dour one-note performance as a dimwitted missionary. There is, however, generous treatment of her monumental work in Autumn Sonata (1978), her last big screen appearance before her death in 1982 from breast cancer. Autumn Sonata strips her bare, as screen daughter Liv Ullmann lacerates her for choosing a career as concert pianist over raising her child. 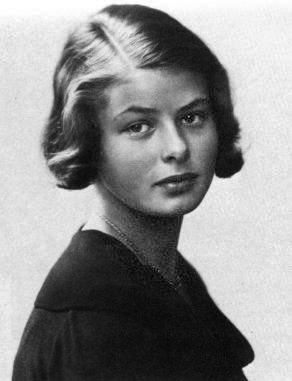 Her own children exhibit no such hate, but anyone who knew Ingrid Bergman would catch the unflattering parallels. By her children’s accounts, she was more friend than mom. She was torn between a love for them and a yearning for adventure only satisfied by being a globetrotting movie star. Her children speak of the pain of lengthy separations, yet none of them exhibits rancor or visible psychological damage. They warmly note her humor and sense of fun and her glittering life. 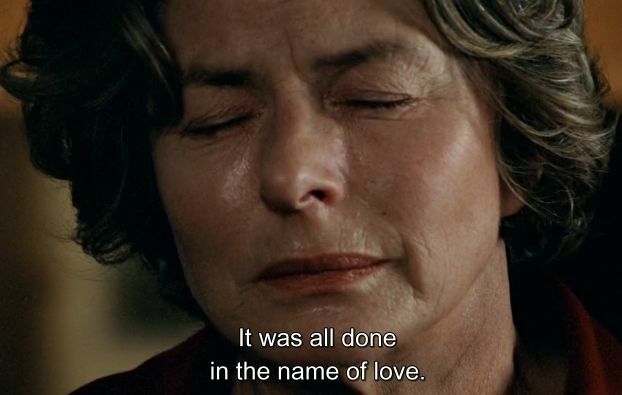 They carry mature adult perspectives on the glories and burdens of being Ingrid Bergman’s children. They came to accept her dual nature and even love her for it. Front and center is the public hysteria surrounding Bergman’s affair with Italian director Roberto Rossellini. In leaving Lindström and their daughter, she was effectively run out of Hollywood by the tar-and-feathers crowd. That might have destroyed someone less worldly, but Bergman spoke five languages and well knew that life didn’t begin and end in Hollywood. She married Rossellini, moved to Italy, and delivered three more children. She and Rossellini made five films neatly classified as Italian neorealism, including Stromboli (1950) and Europa ’51 (1952), before divorcing in 1957. By then, Bergman’s sins were absolved by the American public, and she returned triumphantly to English-speaking screens in Anastasia, snatching an Oscar along the way. She would marry once more, and maneuver between films, television, and theater. She did some of her greatest work toward the end, free of vanity as the camera took in each line of her aging and eloquent face.